Fits over ejector rod and down into the cylinder to reach and remove the Crane Bushing from Colt revolvers. Fits Colt Python, Trooper, Officers' Model, Official Police, Marshall, Cobra, Agent, Police Positive, Detective Special and Pocket Positive. SPECS: Steel, hardened and drawn. Body is 1-3/8" (3.5cm) long, .316 in (8.03mm) diameter. Handle is 2" (5.1cm) long. Passer over ejektor stang og inn i sylinderen nå og fjerne Crane foringen fra Colt-revolvere. Passer Colt Python, Trooper, offiserer modell, offisielle Police, Marshall, Cobra, Agent, politiet positiv, etterforsker Special og Pocket positiv. This tool removed the bushing screw with ease on my Colt Det Spl. Just be careful when the bushing is almost out that it doesn't fly across the room under the spring tension. You will never find it once it rockets across the room! I was pleasantly surprised to discover that this tool also fits the crane bushings of Colt New Service revolvers. A well made tool but it has its limitations, a corroded bushing that is stuck in the crane will break the tool. You can however easily file down the shoulder of the tool and expose new "teeth". Broke on first use. Tang bent, then broke. Old gun but clean, no rust but soaked in pb blaster overnight specifically because other review said it broke but it broke anyway and marred the bushing. 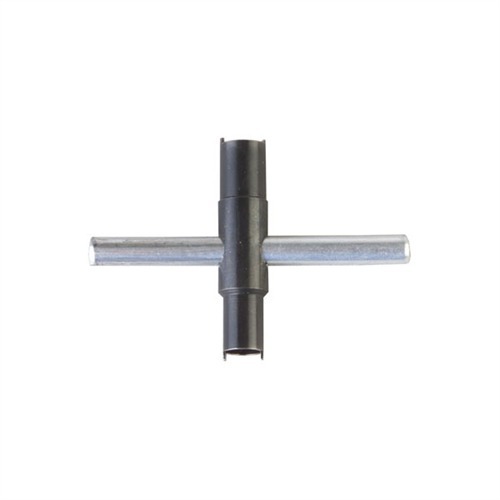 Crane Bushing Tool 050806106550 Passer over ejektor stang og inn i sylinderen nå og fjerne Crane foringen fra Colt-revolvere. Passer Colt Python, Trooper, offiserer modell, offisielle Police, Marshall, Cobra, Agent, politiet positiv, etterforsker Special og Pocket positiv.